Sign this petition and demand that the Bill Emerson Good Samaritan Food Donation Act be mandated, and prevent nutritious food from being thrown in the trash. Food waste is a problem wherever it could be put to better use. In the United States, where more than one-tenth of all families are living in food-insecure households , at least 40 percent of the food produced for consumption is never eaten . Instead, perfectly good food is being thrown away because it doesn't meet unrealistic standards of appearance . "It's all about blemish-free produce," according to southeastern U.S. produce distributor Jay Johnson. "What happens in our business today is that it is either perfect, or it gets rejected. It is perfect to them, or they turn it down. And then you are stuck ." The businesses that get stuck have been sticking their surplus in the trash, or letting it rot in warehouses. But the fact is, there's enough to feed the nation's hungry several times over. A 2014 EPA study found that the U.S. wastes at least 38 million tons of food each year . That's enough to provide 2,000 calories for 190 million Americans, every day of that year . France first banned its supermarkets from wasting unsold food in early 2016, mandating they donate the items to charities and food banks instead . A year later, the country found itself at the top of the 2017 Food Sustainability Index, which tracks the food waste and recovery efforts of 25 countries around the world . Per capita waste was brought down to 234 pounds of food annually, while their American counterparts are throwing away more than 250 pounds of food per person, per year . Clear regulations aimed at diverting nutritious food from landfills are effective. And, in the U.S., such a regulation already exists. The Bill Emerson Good Samaritan Act provides protection for food and grocery products that meet all quality and labeling standards imposed by federal, state, and local laws and regulations, even though the food may not be "readily marketable due to appearance, age, freshness, grade, size, surplus, or other conditions ." It removes the liability a business may fear after giving unused products away, for all but gross negligence or intentional misconduct. Despite being signed into law, many restaurants and grocers still don't donate food. If mandated by Congress, this bill could make fresh, nutritious food available to the millions who need it most. 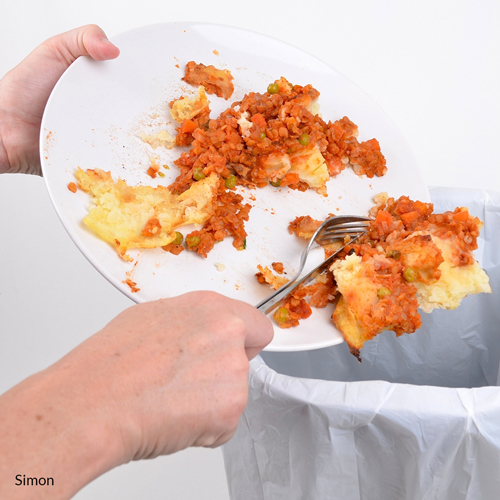 Sign today, do your part to end food waste, and put a stop to needless hunger! Food Donation Connection (2015), "United States legal liability issues" retrieved February 14, 2018, from http://www.foodtodonate.com/Fdcmain/LegalLiabilities.aspx. Natural Resources Defense Council (2018). "Food Waste." Retrieved February 15, 2018, from https://www.nrdc.org/issues/food-waste. Susanne Goldenberg (2016, July 13), "Half of all US food produce is thrown away, new research suggests." Retrieved February 15, 2018, from https://www.theguardian.com/environment/2016/jul/13/us-food-waste-ugly-fruit-vegetables-perfect. Food Forward (2017, Sept. 18), "How Much Food Is Wasted In America?" Retrieved February 15, 2018, from https://foodforward.org/2017/09/how-much-food-is-wasted-in-america/. Marie L. Spiker, MSPH, RD, Hazel A.B. Hiza, PhD, RD, Sameer M. Siddiqi, Roni A. Neff, PhD, ScM (2017, July), "Wasted Food, Wasted Nutrients: Nutrient Loss from Wasted Food in the United States and Comparison to Gaps in Dietary Intake." Retrieved February 15, 2018, from http://jandonline.org/article/S2212-2672(17)30325-8/fulltext. Angelique Chrisafis (2016, February 4), "French law forbids food waste by supermarkets." Retrieved February 15, 2018 from https://www.theguardian.com/world/2016/feb/04/french-law-forbids-food-waste-by-supermarkets. Story Hinckley (2018, January 3), "How France became a global leader in curbing food waste." Retrieved February 15, 2018 from https://www.csmonitor.com/Environment/2018/0103/How-France-became-a-global-leader-in-curbing-food-waste. Jean C. Buzby, Jeffrey Hyman (2012, July 20), "Total and per capita value of food loss in the United States." Retrieved February 15, 2018 from http://ucce.ucdavis.edu/files/datastore/234-2425.pdf. The amount of food thrown away every year in the United States is enough to provide 2,000-calories for 190 million Americans, every day of that year. It's time we put those calories where they belong. Food waste is a problem wherever it could be put to better use. In the United States, where more than one-tenth of all families are living in food-insecure households, at least 40 percent of the food produced for consumption is never eaten. In France, where supermarkets have been banned from destroying unsold food, the per capita amount of food waste per person has dropped sharply after just a few years. The Bill Emerson Good Samaritan Act, passed in 1996, provides protection for food and grocery products that meet all quality and labeling standards imposed by federal, state, and local laws and regulations, even though the food may not be "readily marketable due to appearance, age, freshness, grade, size, surplus or other conditions." It removes the liability a business may fear after giving unused products away, for all but gross negligence or intentional misconduct. Despite being signed into law, many restaurants and grocers still don't donate food. Mandating this act would provide the impetus to divert millions of pounds of otherwise wasted food to those who need it, and reduce our nation's waste. I demand you take action today, and mandate the Bill Emerson Good Samaritan Act. That's 6,375 signatures! Let's keep the ball rolling.